Finally, an AR game worth playing. Too bad it doesn't last very long. Spirit Camera: The Cursed Memoir is the best Augmented Reality game we've played, but that's not saying much. These types of games often suffer from a lack of depth, similar lack of graphical punch and a heavy reliance on extreme lighting, three maladies Nintendo's newest 3DS game suffers from. At the same time, it also features one of the more gripping narratives to appear in an AR experience, and for that, we can't help but smile. Each copy of the game comes with a small booklet called the Diary of Faces, a cursed tome that helps the player peek inside a haunted house. That's essentially where you come in. 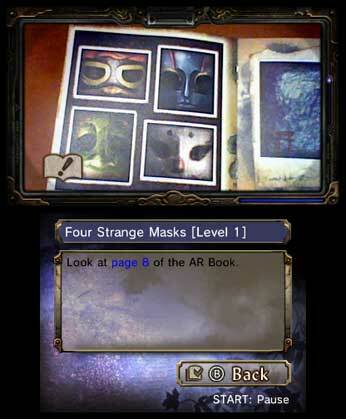 Placing the Diary on a flat surface, you view its pages through the 3DS, which transforms into the Camera Obscura, a device that transports you to the spirit world, where you must rescue a trapped girl named Maya from the dangerous woman in black, an evil entity that enjoys taking other people's faces. If this sounds a bit like Tecmo Koei's Fatal Frame series, that's because it is. That said, you'll spend the bulk of your time communicating with Maya and battling rival ghosts by lining those suckers up in the Camera Obscura's viewfinder and snapping their picture at just the right moment to attack. It's a novel idea the developers mostly pull off. We love focusing the viewfinder on a blank page and watching something appear, and the narrative was spooky enough to keep us engrossed the whole way through. 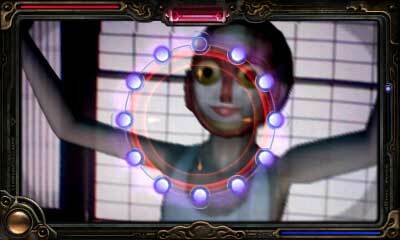 In addition, we like being able to examine the in-game world with the 3DS gyroscope. On the flip side, Spirit Camera has plenty of faults, starting with light. You need a well-lit area to see things clearly, and that's a potential problem, seeing as how you're definition of well-lit and the developers' may vary. You might as well grab some fluorescent bulbs. What's more, the game's not exactly portable. You need the Diary, of course, so figuring out where to put it may derail your effort to play altogether. Then there's the fact that in order to be successful, you must use the tilt controls, moving your body 360 degrees to track down Maya as well as enemies. Then there's the matter of length, or lack thereof. You only need three-to-four hours to beat the game, and there's little to do beyond that, aside from shallow mini games that incorporate the camera in some fashion. Considering Nintendo wants $39.99 for this title, that's a lot to spend for so little. At the same time, Spirit Camera: The Cursed Memoir does an excellent job building suspense, and so long as you have the proper lights, works quite well. Not exactly the game that'll save AR, but after several years of failure, it's a step in the right direction. What's Hot: Some cool AR tricks using the included Diary of Faces, does an excellent job building tension, great use of the gyroscope. What's Not: Requires maximum lighting, takes three hours to beat, silly mini games, costs $39.99.